There was only ever going to be one place to be at first light this morning - Wanstead Flats or should that be Wryneck Flats!! I started my circuit by searching the scrub area around Alexandra lake when the inevitable message came through from Mr Croft. 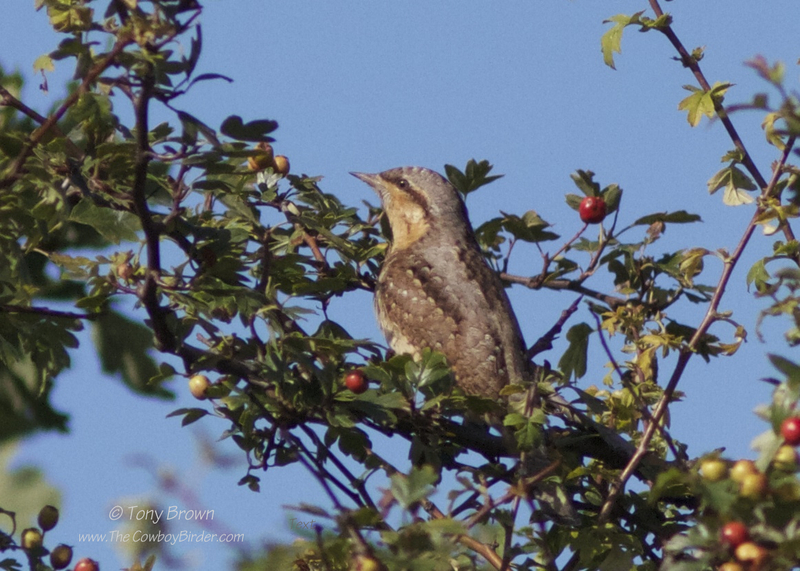 "Wryneck again, east end of Long Wood!" Hot footing it quickly across the football pitches I met up with usual merry band of Wanstead regulars, plus one or two other Wryneck enthusiasts, but by the time I'd reached the area the bird had gone deep into cover - typical! The next hour or two was spent frustratingly chasing shadows as I only kept on catching a fleeting glimpse of the bird, but then, as the sun broke through the clouds...boom, bingo or as I prefer to say yeehaa (well I am a cowboy!) up popped the little stunner on top of the Hawthorn in the sun for all to see - finally rewarded with the views I was after. It doesn't matter how many times I've seen these birds (and I've seen a few) they always get the heart racing, and add a Costa Coffee on a empty stomach into the equation (kindly purchased by a Mr Lethbridge - whoever he is ;-)) and I was buzzing! My second Wryneck on the Flats and much better views than my first. Once I've come down from my caffeine/Wryneck induced high, I think it will be time for a beer! Wryneck "Easy Like Sunday Morning"